What an awesome looking scooter is this! Not only does it have the kudos of being aesthetically appealing, it boasts to be the fastest mobility scooter on the market! Whether you need wheels to cruise to the store, visit the park or just get around to family and friends’ houses – this cheap electric scooter helps you do it all in style. With a 15mph speed and a 30+ mile range, this electric scooter is efficient outdoors, yet gentle enough for store and mall use. 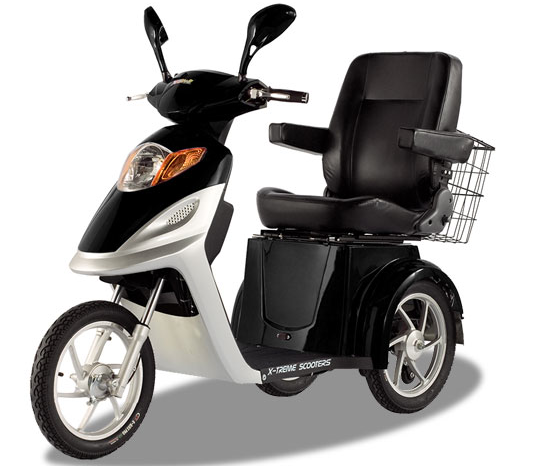 The XB-420M Deluxe Mobility Scooter is designed for use in very tight spaces with very precise control, has a short turning radius and includes a convenient forward and reverse switch. The electric engine is absolutely silent and non-polluting. So, you can take this mobility scooter into and use it in any office or store that has handicap access. A speed-control knob alongside the spring-loaded twist throttle enables you to set it to 'slow' to allow precise control in tight quarters such as a doctor's office. Or, when traveling from your home to the local store, you can crank it all the way up to 'quick speed' and twist the throttle and off you go at 15 mph in just a few seconds! So, the best of both worlds: fine control of your movement when you need to move precisely and slowly in tight quarters, and everything in between up to very rapid acceleration and higher speeds when you need it. You will never again be held back by an underpowered system! If you are not faint-hearted, this electric scooter will ride a wheelie when the speed limiter is turned up to maximum. Robustly built with a strong steel chassis, this electric scooter is built with quality components, and carry up to 350lbs, making it easily suitable for you and all your groceries! Available in a slick black, it features a reverse gear, arm rests, cargo rack and extra under-seat storage. Manufactured by X-Treme Scooters, the added bonus is that this fine scooter is cheap to buy. With a retail price of around $1,700, although there are deals available from distributors discounting the Swanky XB-420M to only $1,299. So these cool and speedy wheels make the XB-420M a real affordable option for a mobility scooter.